We've partly traced the Scott Bennie arc, through Rosco Pecoe and Splitsville. This is probably one of the bands he was best known for, and we're fond of them, despite the emo tag. The old Gauntlet has an archived article on Nine Miles to Morgan you might want to read. Or you might just want to hit the download. Update: we were way wrong with this. Apparently there was a pre-Bennie configuration of Nine Miles to Morgan, headed up by Al Fraser. Just goes to show: never trust anything you read in the Gauntlet. Or here. For reals? Okay, smarty pants - who does, then? And at what point did Bennie join in the fun? 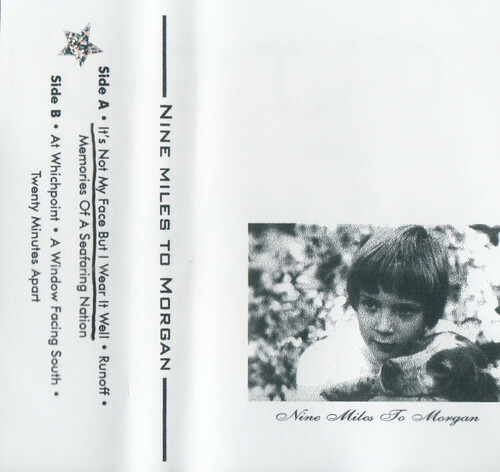 This is the first nine miles tape. The guitarist was Al Fraser a.k.a "The Al" from Big Daddy Ritter, a.k.a "Bud-Ray Kitrelli" from Why? and Alsoknownas. He moved away shortly after this recording, as did Pat May and they were replaced by Scott and someone else who's name I don't remember. Pat came back, Al didn't. Hi Cam Brass here. I can tell you the time-line all members and ajoining bands... all I ask in return is for someone to post John American Car and or Ellen James Society !!!!!! cast iron, you are hilarious. Can someone please re up-load these songs! its timed out. Duh! We screwed up the link. The link above is no longer borken!